There are women and girls missing in our world and I am not ok with it. I am not ok with women’s voices missing from conversations. I am not ok with women’s bodies missing from tables. I am not ok with indigenous women going missing and being murdered. You are sacred. You are a gift to us. We don’t want any girls or women to go missing. We belong to each other. Nearly 20 years ago, I heard this call to pay attention to where women are missing in our world. Her words were a wake-up call. They shook me at the core of my being, because I could hear the cry of a sister on the other side of the world. Truth is: I had not seen her. I did not go looking for her. I had been wrapped up in my own story of freedom. But coming face to face with the reality of the oppression of women worldwide, changed my life forever. I wanted to go look for and stand with the women who were missing in our world. Her words echoed through my soul. And in some way, they became my bold mission. In some way, my life’s work became about looking for missing women. Missing voices. Missing representation. Missing parts of our soul. It is not easy. It’s hard to see what is not there. It’s hard to hear what is not said. But as I learned from my Afghan sister and my South African story, the center of the story never tells the whole story. There are always people missing from the center of the story. If we truly want to see God’s heart for justice, we need to go to the edges. If we want to see God’s heart, we need to wade out to the well in the heat of the day, pay attention to the woman who drops her mite into the offering and we need to see who is familiar with grief. As my life has taken me to the edges of power, it has been here, time and time again, that I have found the voices of greatest courage. 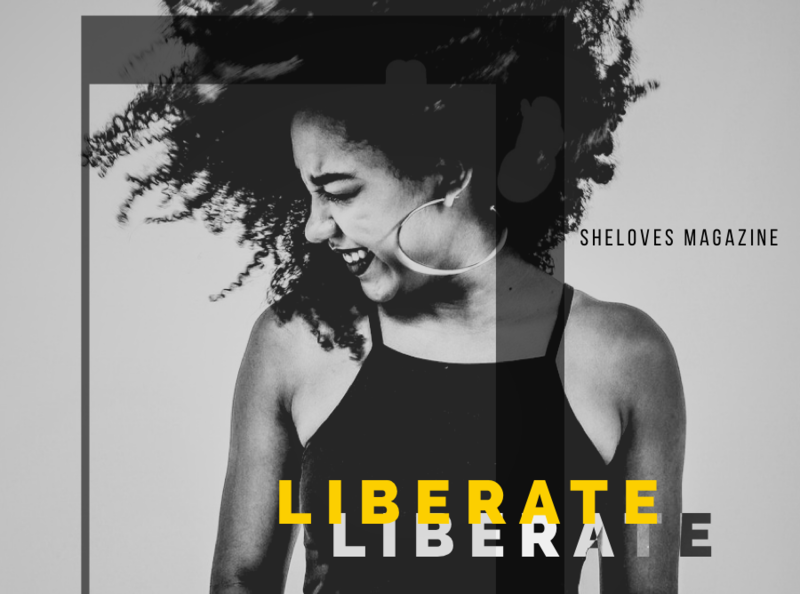 The voices have not only sought their own liberation, but have also offered liberation to those who walk alongside. Looking for missing women, missing voices, missing bodies, is a matter of justice. I believe it is right in line with the heart of God and it is the work of proclaiming good news. I don’t think, we, the church, have represented El Roi—the God Who Sees—well. He has shown himself as the One who SEES those who are hurting, excluded and going missing. But we have not always followed His lead. I have become convinced that missing women—whether literally from society, or missing because their voices had been silenced, their power taken or their light dimmed by abuse—are very close to the heart of God. In the parable of the lost sheep, we know the Good Shepherd would not rest until the one missing sheep had been found. It did not matter that 99 sheep were safely in the fold; that one sheep mattered. The missing women and girls in our world matter. But I have to keep asking myself: Do they matter to me? Does my life show that missing women matter? In Canada, there is currently an inquiry into our Missing and Murdered Indigenous Women. 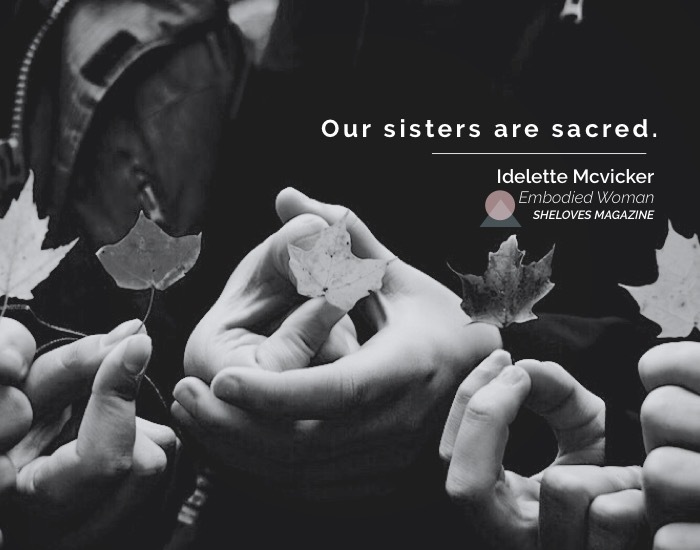 While there is a lot of disagreement about the number of missing and murdered indigenous women in Canada, Indigenous women’s groups document the number to be over 4,000. According to the 2004 General Social Survey, indigenous women 15 years and older are 3.5 times more likely to experience violence than non-Indigenous women. I have been waiting for the church to rise into this issue for nearly 20 years. I have been waiting for the women of the church to speak up. I have been watching and waiting. While there are pockets of the church paying attention, mostly we have been silent. Former Prime Minister Stephen Harper said indigenous women were not “really high on the government’s radar.” I guess, indigenous women were not high on the church’s radar. But there is a problem when our indigenous sisters and daughters, mothers and friends go missing. These losses cut through history, affecting families and communities. The cost to us as humanity is too great. I am tired of waiting for others to tell us what is priority. If WE are the church, we, too, get to say what is priority. We get to speak up and speak out. We get to pray and rally and stand alongside. We have to go looking for our missing sisters. We have to ask, Why do they go missing? We have to speak out against the systems that make it possible for them to go missing in the first place. A part of us will always be missing, until there is justice and visibility and acknowledgement of those who are missing. A part of our voice cannot rise until their voices rise. On this International Women’s Day, it is a day to celebrate the good that has been done. It is a day to celebrate the voices that have risen. It is a day to celebrate the injustices that have been named and validated. But on this International Women’s Day, more than ever, we need to go looking for our sisters, mothers, daughters and friends who remain missing. Let’s go looking for the ones who have been silenced. Let’s go stand where there is abuse and injustice. Let’s listen for the ones who have been devalued. 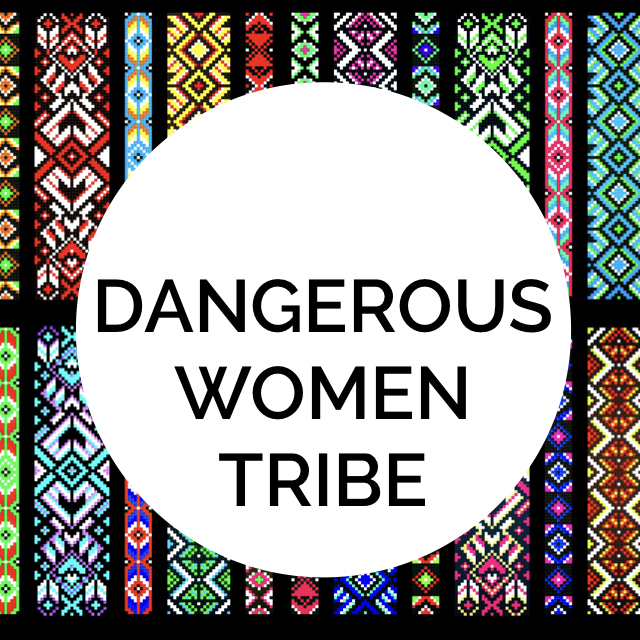 Let’s tell our indigenous sisters that we, the women of the church, see, love and honour them. We will not be satisfied until indigenous lives take up their rightful place in the Body of the World. This April, SheLoves will be part of the Atamiskakewak National Gathering in Moose Jaw, Saskatchewan. 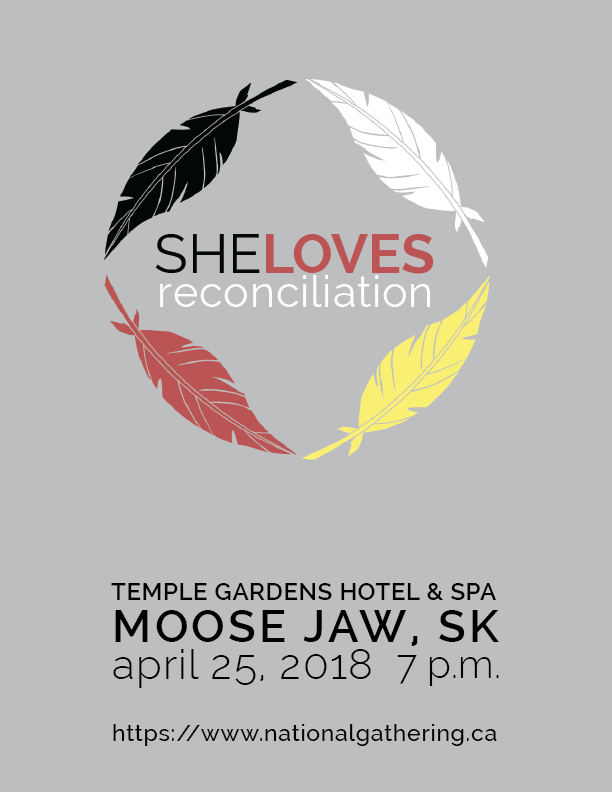 On Wednesday, April 25 at 7pm, we will host a SheLoves Reconciliation event, a celebration of friendship between indigenous and non-indigenous women, an evening of stories, prayer and walking this path of reconciliation and restitution. Kallie Wood will be there. Sarah Bessey will be there. I will be there. Melaney Gleeson-Lyall will be there. Shaley, Courtney, Kathleen and Nichole Forbes of our Events Team will be there. Come, join us.